When I found out recently that the Orient Express comes to Plymouth I was very excited. I’ve always wanted to travel on the Orient Express, ever since reading Agatha Christie’s famous book ‘Murder on the Orient Express’. For me this historic train has an aura of glamour, mystery and romance which is hard to resist. So when the Orient Express company offered InPlymouth.com two tickets to review the experience for ourselves, Ash and I were more than happy to oblige. 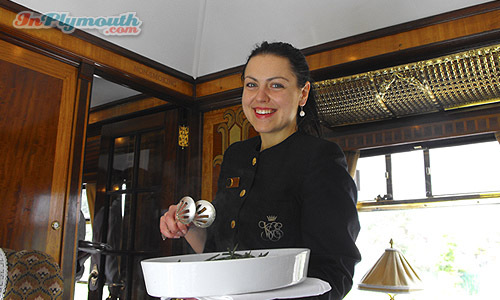 Did you know that the Orient Express visits #Plymouth? 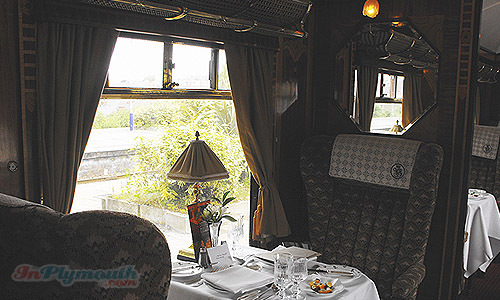 The British Pullman carriages of the Venice Simplon Orient Express offer a range of day trips throughout Britain to historic towns, sporting and social events. It also covers the British leg of the famous journey from London to Venice. It comes to Plymouth once a year and a steward told me that this was one of her favourite journeys due to the fabulous coastal scenery. When Ash and I arrived at Plymouth Station ready for our trip, there was already a celebratory atmosphere. Groups of well-dressed people clustered on the platform in small groups, looking pleased and expectant. When the train pulled in everyone felt a sense of excitement as the elegant, vintage, cream and brown carriages glided to a halt. Each carriage has its own name and decor. We were travelling on Zena, a first class parlour car with 24 seats, built in 1928 by Metropolitan Cammell Carriage and Wagon Co. Its most famous journey was in ‘Agatha’, a 1976 film about Agatha Christie. When I boarded Zena, I felt as though I had been whisked back to the 1930s, an age of elegance and sophistication. The only thing lacking was Hercule Poirot. Zena is decorated with the most beautiful Art Deco marquetry on its panelled walls. Snowy white tablecloths adorned the tables, along with brass lamps with cream shades that matched the curtains at the windows. Small brass luggage racks and elegant glass-shaded ceiling lamps completed the picture. Fine plates with the Venice-Simplon Orient Express (VSOE) crest were on the table; and the same crest could be found on the crystal glasses, the silver cutlery, the elegant vase and the lace antimacassars. Smartly uniformed stewards welcomed us to our seats and a glass of champagne was immediately poured for us. The attentiveness of the staff was very noticeable. The stewards came from Britain as well as all over Europe, but they all had one thing in common: they were incredibly polite, friendly and well-trained. As the train pulled out from Plymouth Station I prepared to relax and enjoy our journey. Five courses of delicious food using quality local produce were served to us, along with wine, and coffee to finish. 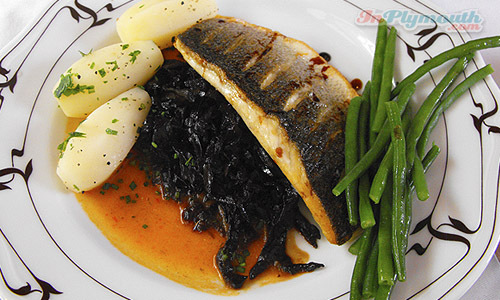 We enjoyed wild river trout terrine, asparagus and wild rocket soup, organic lamb loin or sea bass, a cheeseboard of British cheeses with home-made chutney, and a frangipane tart that melted in the mouth. I was amazed at how much I was able to eat (I’m not normally a big eater), but the food was too good to leave on the plate. I was particularly impressed at the ability of our steward to serve soup on a moving train without spilling a drop (many people can’t manage this on solid ground). Many train journeys can seem long and tedious, but not this one. Not only is this stretch of track particularly picturesque, going along the coast for much of it, but I was enthralled by my elegant surroundings, the comings and goings of the stewards and the obvious enjoyment of the other passengers. Many people were celebrating a special birthday or anniversary. One couple we spoke to were celebrating their Golden Wedding Anniversary, whilst another couple were going on great train journeys all around Britain. The stewards encouraged us to explore the other cars, as each is unique and beautifully restored. For example Audrey, built in 1932, has marquetry landscape panels and Art Deco strip lights, and carried the Queen and other members of the Royal Family in 1953. Whilst Perseus, built between 1938 and 1951, is decorated with ash panels and old prints. Perseus was used in Winston Churchill’s funeral train procession in 1965. The attention to detail is really impressive. 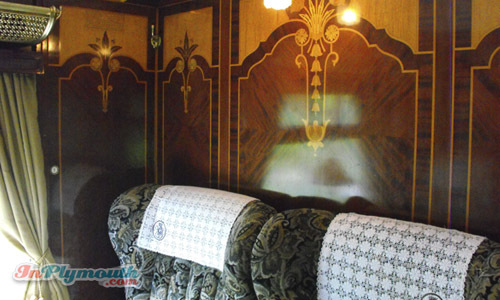 Even the lavatories in each carriage are elegant, with marble counter tops, wood panelling and a unique mosaic on each floor. For example, Perseus was represented dramatically holding up the severed Medusa’s head. A steward told us that this is the most popular mosaic with visitors. Each carriage has a real sense of history and it’s lovely to see them being used for their intended purpose, rather than being placed in a museum. When the train reached Taunton I was disappointed because the trip was half over. As far as I was concerned it could have gone on for a lot longer. However, luckily we still had our journey back to Plymouth to enjoy, aided by a mouth-watering dessert of prune and apricot frangipane tart with cream, and smooth hot coffee. I felt incredibly relaxed in my comfortable seat as the train jiggled in a hypnotic manner. After we had finished eating, our steward put a small blue box in front of us with the Orient Express logo in gold, and inside was a delicious chocolate. I thought it was a lovely finishing touch. When we pulled into Plymouth there was a visible sense of disappointment that the journey was over. All the passengers appeared to have had a lovely time, and I overheard one woman asking jokingly if she could stay on board. So who should travel on the Orient Express from Plymouth? 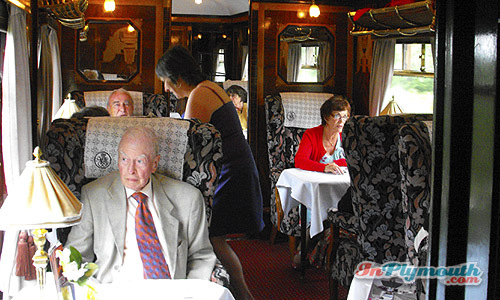 Agatha Christie fans, people who love trains, and anyone who is fan of luxury. This trip is a unique experience and made me feel incredibly special and privileged. Residents of Plymouth who have a special occasion coming up, such as an anniversary, a birthday, or who just feel in need of pampering, have a chance to to celebrate in a very unique way. The Orient Express only comes to Plymouth once a year, but it offers the chance to make memories that will last a lifetime. The combination of the beautiful period surroundings, the fine food, the attentiveness of the stewards and the picturesque countryside through which we travelled, all went to make up a magical experience. I whole-heartedly recommend it.